I recently decided to change my kitchen to a Mickey themed area. 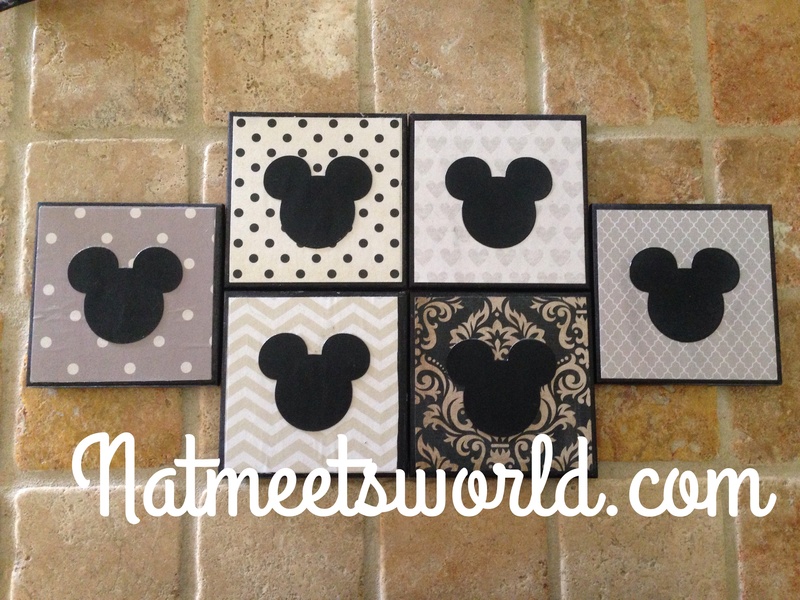 The problem is, I don’t want a bright colored Mickey theme, but a neutral and more modern and chic one instead. This can be a challenge, being that most of the merchandise available for a Mickey themed kitchen includes brightly colored plates, utensils, and other items…..including coasters. I decided to make several of the items for my kitchen instead of purchasing them to make sure the neutral Mickey theme I have in mind comes to life. I recently read a post on the Disney Park Blog on DIY Park Guide Map Coasters, and decided to follow the directions but with my own twist on the concept. The great thing about this tutorial is that you can use any color or theme you like! Just follow my instructions and you will be good to go. 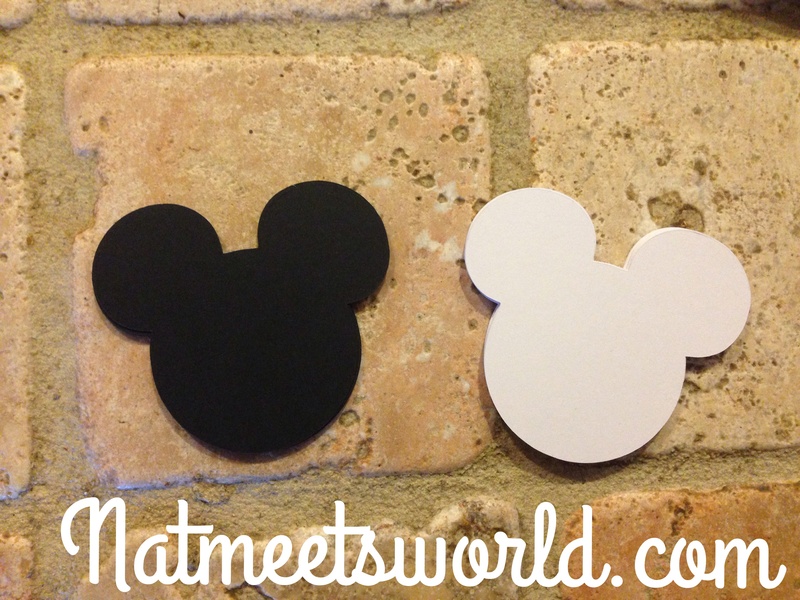 The great part about this tutorial is even if you don’t want a Mickey theme, you can still add your own taste to it without the Mickey silhouette. Let’s get started! 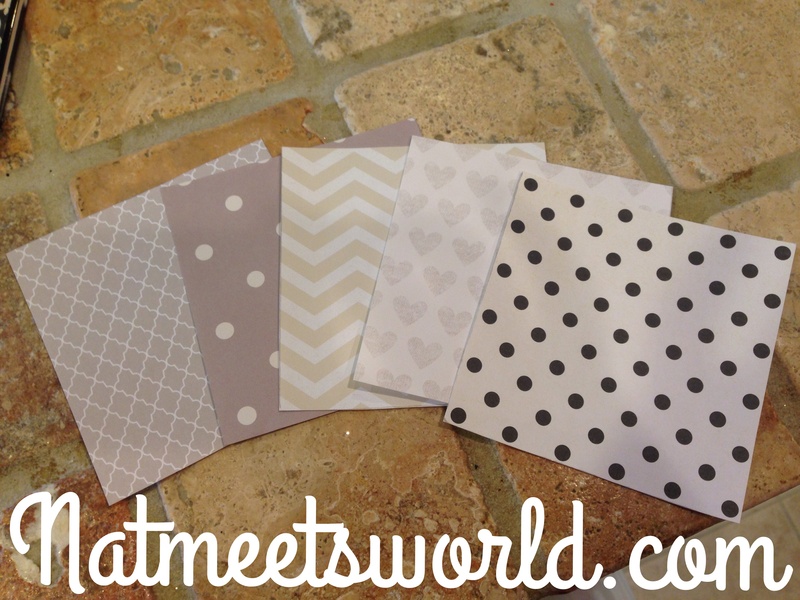 Depending on the amount of coasters you want to make, you will need that same amount of scrapbook paper. 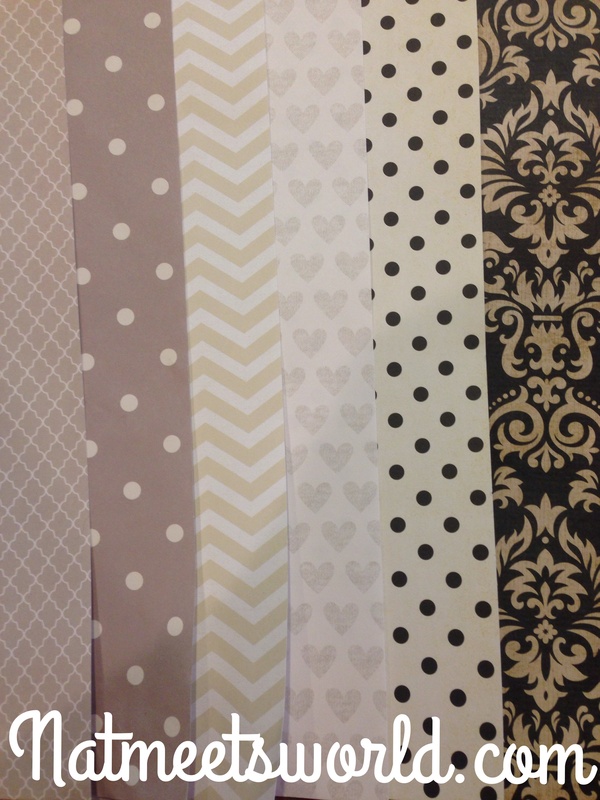 I chose these 6 neutral colors with designs. They are all different but they match because they are all neutral colors. 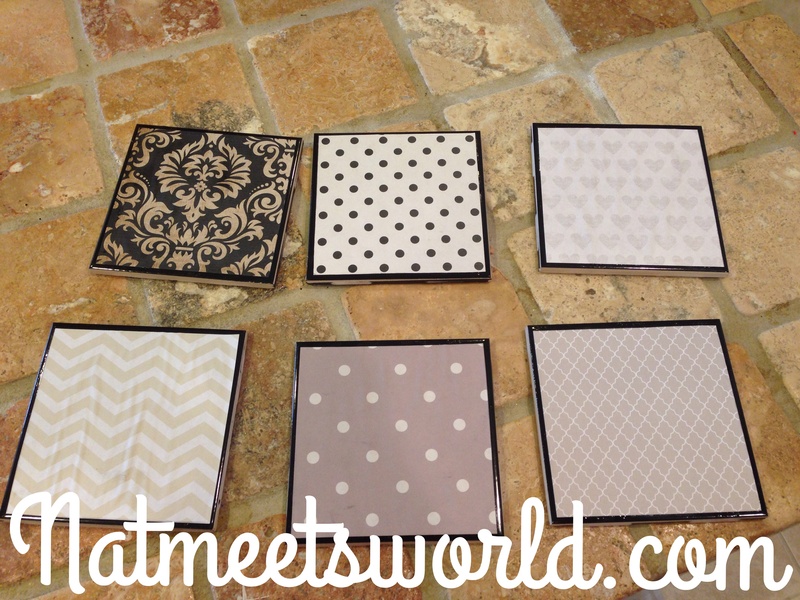 Depending on your theme, try to vary the patterns and colors of your scrapbook paper within the same color family to add a nice look to your coasters. Step 1- Clean each tile with a damp paper towel and then dry it. Set aside. I placed my cork square in the corner so that I only had to cut two straight lines, instead of four. This is the final cut scrapbook paper. 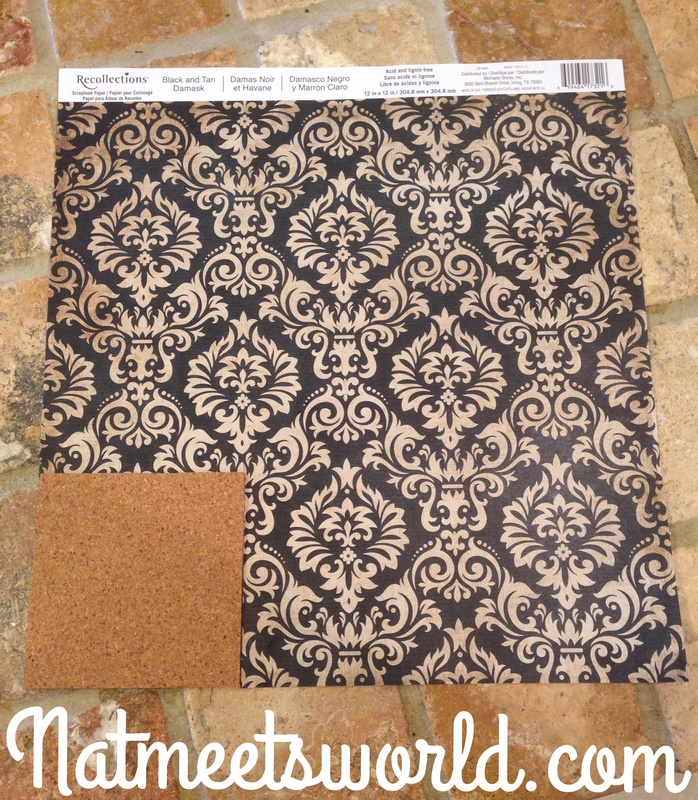 Step 2- I was lucky enough to find a perfect sized cork square for my tiles, so I decided to use it as my outline to cut my scrapbook paper. 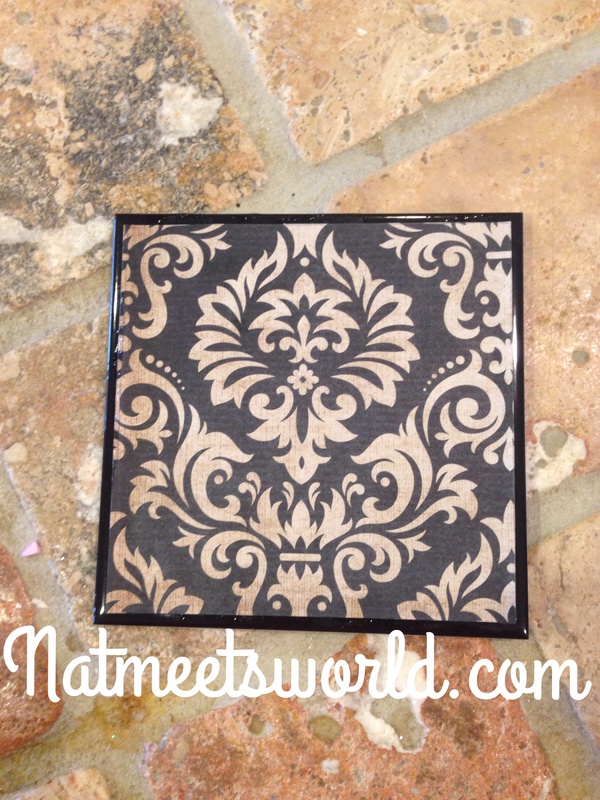 Using the cork square, place it in the corner of your scrapbook sheet, and trace with a pencil. Cut out the square shape. This shape will not cover the entire tile, instead it will allow a thin border of the tile to show after you glue it on, which gives it a nice, polished look. Repeat this step for all of your scrapbook papers. 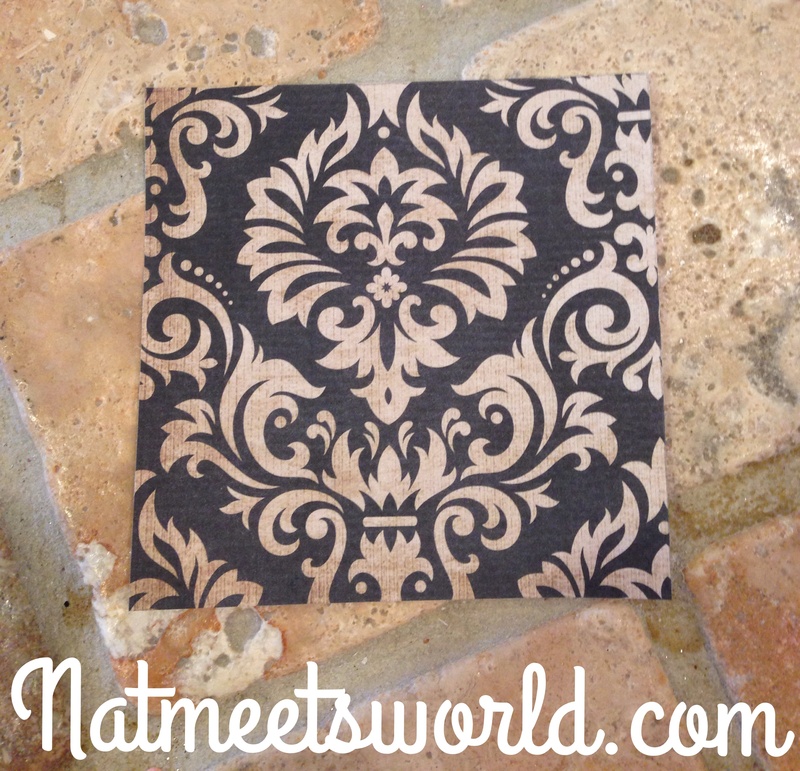 Scrapbook paper glued on tile. Step 3- Brush a thin layer of decoupage glue with the foam brush all over the top of the tile and center the scrapbook paper square on top. Make sure to smooth out the paper on the glue, especially on the corners. Repeat this with each tile you are using. As the glue dries, check each tile and make sure the paper hasn’t lifted by pushing down in the areas needed. Make sure the glue is completely dry before moving on to step 4. 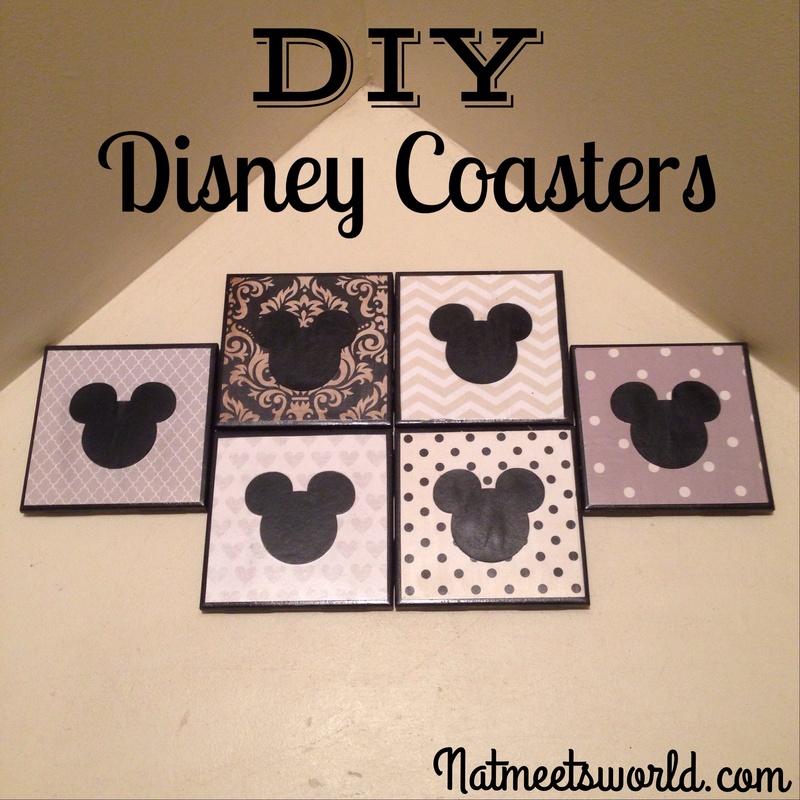 Step 4 (optional) – Brush a dab of decoupage glue on the back of the Mickey silhouette and center it in the middle of the tile. Make sure it is completely glued onto the tile without any lifting corners. Step 5- Using your foam brush, brush another thin layer of decoupage glue over the paper and silhouettes on each tile. Let dry completely. 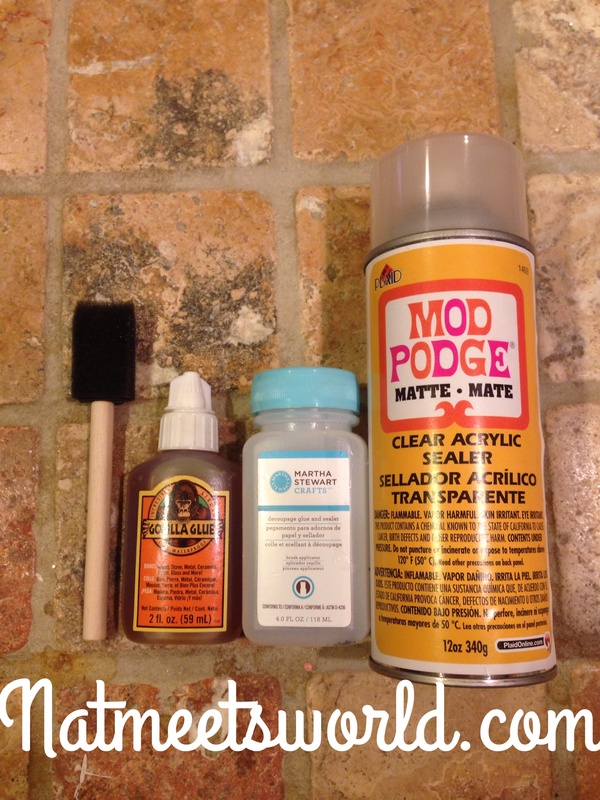 After they’re dry, brush a thin final coat of decoupage glue all over the tile again. Let dry completely. 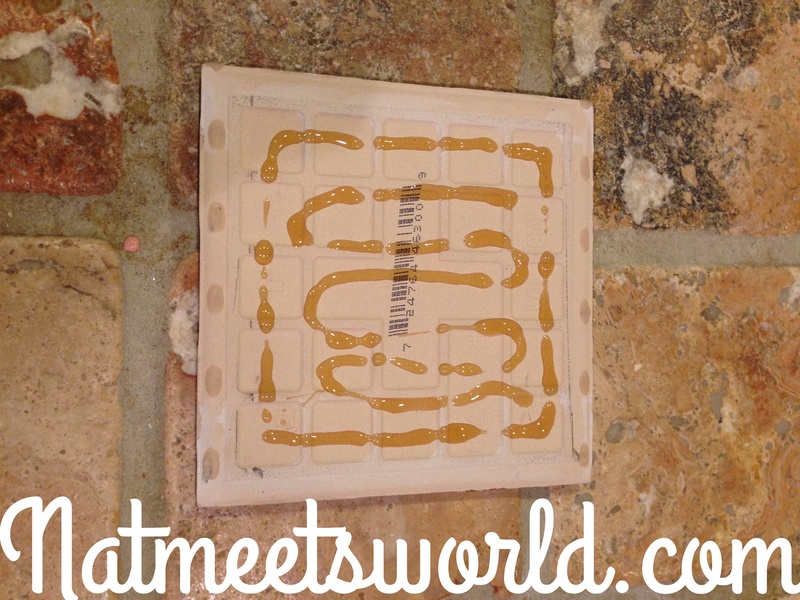 Step 6- Spray a thin layer of the acrylic sealer all over the tile and let it dry completely. For more detailed information, just follow the instructions on the acrylic sealer can. Gorilla Glue on the bottom of the tile. Step 7- Spread a thin layer of Gorilla Glue on the bottom of each tile. Gently center the cork square and press down gently, but firmly. Let dry 3-4 hours. You’re all done! Enjoy your brand new coasters, and comment below or attach a picture of yours! I would love to see what you created!